this thing says its 27% - have you ridden that? Sometimes distraction is a great way to learn new things about yourself. Have you ever experienced that? where you're doing one thing while doing another and suddenly you realise that you're doing something you didn't think you could do - or that was hard before but this time, you didn't notice? Usually when i'm on the bike, i'm going out for two things: time and speed. How long can i stay out; how fast can i go in that time. Push push push. The parameters of this work out killed speed. No speed. couldn't think about speed. -instead the objectives were: time, heart rate and cadence. On some work intervals, the focus was on cadence (number of revolutions of the pedals per minute); on some the focus was on heart rate. On the recovery intervals, it was all about heart rate. This dual focus of either cadence/time or heart rate/time meant that the terrain in front of me was incidental: my priority was to find the gearing that would let me get the heart rate or the cadence for the specific interval. That experience was really pretty cool. For instance, if i hit the start of a hill when i was about to start a recovery interval after an intense interval, and the target was to get my heart rated down - i had to go up that hill at pretty much of a crawl. I could hear this voice in my head saying "what will those cars passing you be thinking of you going this slowly!" - absolutely nothing. The other voice inside was going ok ok you're just about in the zone, slow down a touch - yes got it ok, keep it, get ready to gear up for the descent how are you going to keep your heart from dropping more going down?? That hill became something else entirely than THE CLIMB - just because of that shift in focus. By knowing the particular road i was on, it was also interesting to be able to anticipate where different parts of the ride were going to present different terrain for the various intervals - there was a wee bit of planning - perhaps even strategizing - about how to make those shifts work as best as possible. That kind of planning was fun too - oh look - i chose a slightly different path for this part to make sure when i hit the work interval i wasn't going down hill. Cool. A lovely side effect of this altered state of focus - that is, where the terrain is another variable in the mix rather than the Daunting Prospect - is that i learned i can do more shaping around the experience of the hill based on what my priorities are for the skills i'm working to develop: just because there's a hill doesn't mean i have to see it as a hill, as a thing which must be gotten over as quickly as possible, isn't that the point of hills? Well, perhaps not. Today the hills were interesting variables to situate within effects of gearing and heart rate to do a particular kind of practice. For my next outing, they may become climbs again. Or perhaps something else. Is this altered state, stating the obvious? Now for folks who have been riding and training on the road awhile this approach is likely eliciting a great big "duh" - yes that's what training is about: you have a plan and you execute the plan within the context of the terrain and the weather. If you're seriously trying to build for an event (like a first sportive...)you do the plan. But there's something else going on here: once upon a time i ran x-country, and if we were doing repeats we went to the track; if we were doing hill repeats, we went to the hills. We found terrain that mapped to the goals of the training, you see? Today, the terrain/weather was incidental. 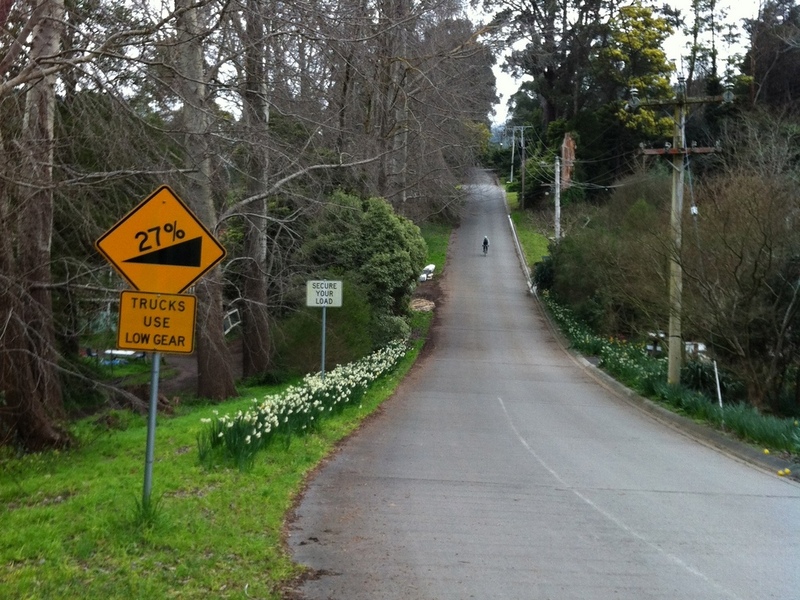 Now i suppose if the goal is to do hills it's bloody challenging to do that workout without hills, so what am i saying? Perhaps it's that if presented with a hill - a usual daunting challenge - one need not treat it as A Hill and a Climb but as a gearing or heart rate or cadence problem. The key bit there is that when it is a gearing or a heart rate or a cadence problem for set temporal intervals, that problem becomes, it seems, more interesting, more tractable, more FUN, perhaps more rewarding even? What makes this translation important to me? It kept me riding today. Rather than go through the psychological torment of "oh god there's that hill, too, actually three of them..." it's it doesn't matter about SPEED - today is not about speed - it's about maintaining other parameters. It's not always about speed. That's just one measure. Wow. that's just one measure. Right now, in fact, it's apparently more important to get miles on the bike into my body than just about anything else. Having that template today to focus on exploring cadence and heart rate and time let me get more miles in than anticipated, let me experience delight about hills, learn something new about my relationship to that particular terrain challenge, and weirdly, not feel like scarfing down lunch afterwards - but that's an aside. Have you had moments of translation like this? where you were taken by surprise that you had just done something because it was recontextualised as something else? Maybe a hike became doable because it was primarily a walk with a colleague instead? and suddenly the miles dropped away? Or maybe it was some job of work that got completed because rather than being a statistical anaylsis, it was helping a friend solve a problem?? Will be keen to hear. And in the mean time, here's to Translation. And Hills not always being Hills. 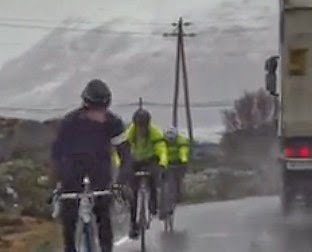 There's a concept in road cycling called "the belgian hard man" - it seems it's a kind of guy fetish in its "true" context where there's some deep respect for stories of riders who go out in all kinds of inclement weather and nasty roads and just BIKE (see gals to left getting sprayed by passing flemmish truck: complete promo vid here). Somehow, doing it "getting it done" all that stuff gets big respect points. As bikesnob notes in his wonderful book Systematically and Mercilessly Realigning the World of Cycling, there's a big celebration of suffering with road biking, and the cult of the Flahute seems to epitomize it. But what if that's all a ruse? and these folks are having FUN! For example: today, i went out in real british shite wind blowing rain pouring bleck at about high noon with good light. With the miracle of modern technical fabrics - and some clever use of traditional ones (like wool - nothing like it) - i stayed, well, comfortable. And as such, i was delighted with the ride: few people on the roads; fewer on the limited bike path areas, and the delight of saying "yes" to a training ride rather than turning around and saying i'm baggin' it; headng for the trainer. Truly, v. little in the way of suffering here other than bits of the ride designed as a test of current levels. And then that test fell apart. I'd had it all nicely programmed so i wouldn't have to think about it: could just read a screen and see data recording, and then it seems i'd mis-set a 1 min interval to an hour forty. IT did seem like something was a bit off. So there's my test ride sozzled - For those who have done these, you know part of the point is to build up to a particular intensity for a test phase. So having to stop figure out what's wrong, try to reset etc - it's not optimal. Now, i could get all annoyed as i'd built a week up towards this effortful thing, but what would that do? And the joy if it all was it seemed in the first half of the test when i wasn't sure what had happened, i'd actually ridden out further than i'd thought would be likely. That's a Good Thing - may mean i'm a wee bit better tuned than i'd anticipated. Anyway more miles under my belt right now - and more get Fit minutes - it's all good. So, with a real head shift for me, i let go of the test, and focused on seeing how well i could enjoy the ride home - focusing on tempo and the such like - where the wind and rain were excellent resistance for assessing power, pace, heart rate, etc. And heck, really, what fun. I'm outside - outside is good. One of the things about outside being quite so good relative to inside is that quite often it calls more systems into play than inside - we have to be aware of stuff. On a bike, it's still life and death (you should see the UK stats). Balance, cognitive challenge of awareness, strength, effort. The main thing: the ride was FUN. And this got me thinking about the whole belgian hard man thing - maybe it's fun for them too? maybe the suffering thing is either inaccurate or a cover? I mean, it COULD be miserable - if i'd been wet and cold that would have been crap. really - i don't find that a great celebratory experience - or particularly intelligent. So perhaps what i'm suggesting is that what looks hard to southerners perhaps or west coasters looking at belgian guys riding in the muck - ain't so hard to people raised in that terrain. It might even be fun. I admit: i could have this whole thing wrong. Maybe the belgian hard man revels in misery, and my belgian state of mind to love whatever the envirnoment presents is not a belgian hard man of the mind. But i figure, today, out pretty much alone on the roads, going for a training test so pushing hard, and finding a love in the elements as a help rather than a hinderence - that was sweet. It was unexpected and fun and heck, i did it - and that means i'm actually, measurably, perhaps also spiritually better for it.